Belize was once a British colony so English is the official language. The population is approximately 320,000 and is a diverse mix of Mayan, Mestizo, Creole, Garfuna, East Indian, Mennonite, Arab, and Chinese. Kriole is the most widely spoken language. Religious freedom is guaranteed in the constitution and around 80% are Christian. You will also find adherents of Hinduism and Islam, mostly among the East Indian and Arab immigrants. 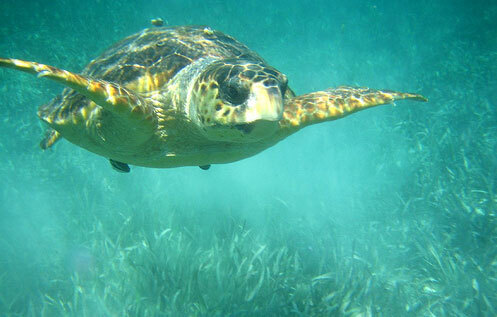 Located in Central America, Belize offers beaches and offshore islands for exploration. Feel the winds off the Caribbean as you gaze upon the national flower, the black orchid. Enjoy "rice hour" or lunch in a street cafe. Once part of the Mayan empire, there are still ruins to be explored as well as an extensive cave system. While you're in an exploring mood, the largest barrier reef in the Northern Hemisphere is just off the coast, with miles of coral reef to see. In fact, all sorts of sports are available in Belize from zip lining to canoeing. And like any resort area, there is lots of music. 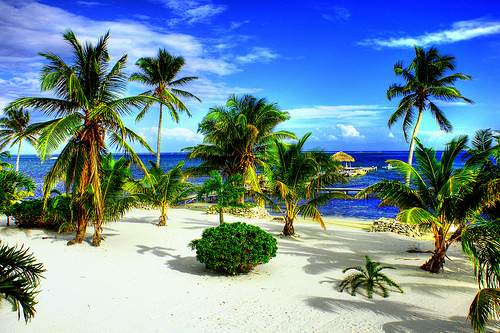 Belize is located on the Caribbean coast of Central America. It encompasses 8,860 square miles (22,960km) and has many lagoons around the coast and the interior. The landscape varies from highland plateaus to lowland forests and there are two rivers, the Honelo nad the Sarstoon. Off the coast are 450 islets known as cays (pronounced keys). And as mentioned, the second largest barrier reef in the world is just off the coast. The climate is tropical with wet and dry seasons. The temperatures range from 75 degrees Fahrenheit in January to 81 degrees Fahrenheit in July, although the southern highland plateaus are noticeably cooler. The best beaches are not along the coast but rather on the cays with the most popular being Ambergris Cay. You can stay in San Pedro Town and relax on the sugar white sands of the beach, splash in the waves, or go snorkeling or deep sea diving. If you choose to deep-sea dive, don't miss seeing the barrier reef. 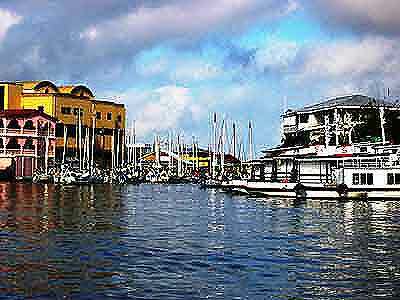 There are two casinos in Belize, both in Belize City. The biggest is in the Princess hotel. In fact, the Princess hotel is responsible for much of the entertainment in the city. The Palace has the second casino; also well worth seeing. Belize is conscious of its past as part of the Mayan Empire and has set aside "La Ruta Maya" as an archaelogical reserve. You can visit the museum, see two 16th century churches or see a 19th century sugar mill. 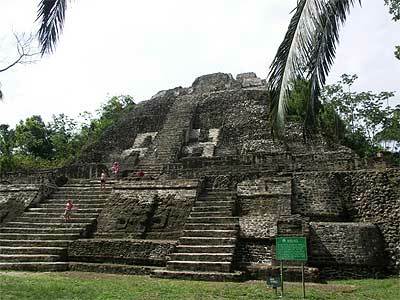 Belize was a part of the Mayan Empire from 1500 BC until 800 AD when the Empire went into decline. The Spanish attempted to colonize Belize but were foiled by Mayan rebellion. Beginning in 1638, English and Scottish buccaneers, called baymen, used Belize and her cays for shelter. By 1700 they had begun cutting logwood for the fixing agent that was used in wool dying. The Spanish granted rights to Belize in exchange for an end to piracy. Also in the early 1700's, African slaves were imported to cut the logwood. By 1800, logwood had been abandoned in favor of the more lucrative mahoghany. The British appointed a superintendent in 1786 but Belize was largely left to its own devices. The settlers formed a self-governing body called the Public Meeting. The Spanish attempted to take over Belize but were defeated in the Battle of St. George's Cay on September 10, 1798. This is still celebrated as a national holiday. In the early 1800's the British government demanded that slavery be abolished and threatened to suspend the Public Meeting. In 1838, the British abolished slavery in all their empire but this had little practical effect in Belize where it was still profitable. Even as slaves were supposedly emancipated, measures were passed to severely restrict their freedoms. South America was emancipated from Spain in 1836 and in 1862 Belize became a British Crown Colony called British Honduras. The Belize Estate and Produce Company controlled much of the colony at the time, owning one half of all private land in the colony. Mahoghany was the main export into the first part of the twentieth century. The Great Depression of the 1930's led to the near collapse of the economy. However, it also led to reforms in the labor laws including the formation of unions. In 1934 there were demonstrations demanding the independence of Belize. World War II improved the economy but then the British devalued the British Honduran dollar. This catastrophe led to the formation of the People's Committee, a force for independence. They were succeeded by the People's United Party, which began a process of constitutional reforms in 1954 that were finalized in 1964. This was also the year Belize was finally granted self-rule and George Price was appointed as governor. 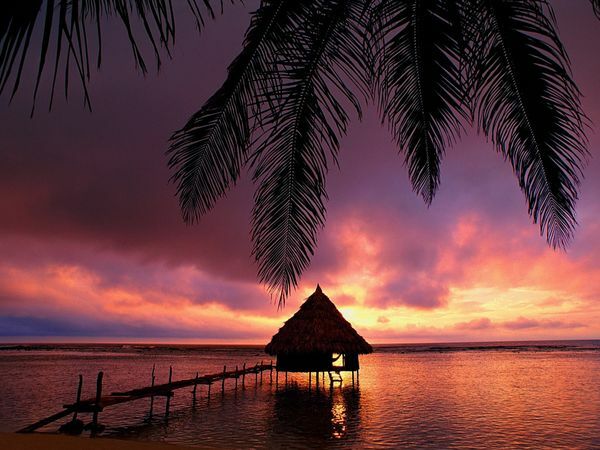 The country changed its name to Belize in 1973. On September 21, 1981, Belize finally became independent from Great Britain. Guatemala refused to recognize Belize, as they had been claiming part or all of the country for some time. British troops were deployed to ward off a Guatemalan threat. The People's United Party won all elections until 1984 when the United Democratic Party won the elections and Manuel Esquivel was elected Prime Minister. Guatemala finally recognized Belize in 1992. For nightlife, the Princess hotel has live entertainment and the Princess casino. The Princess hotel also has the Calypso Bar, once of the most popular nightspots, and there are occasional art festivals, you just have to check. Hotels provide most of the entertainment so the more there are, the more variety you can find. The people of Belize are known for their courtesy. Most are informal and friendly, and it's common for people to greet each other on the street. Belize is also known for its population of Garafuna, a people from mixed Carib, Arawak, and African ancestry. UNESCO sited the Garafuna language as a Masterpiece of the Oral and Intangible Heritage of Humanity. Belize has a wide variety of food traditions. Breakfast is called drinking tea. Lunch is often referred to as Rice Hour after the red beans and rice commonly eaten at that time. Rice Hour is important to the people, and the country comes almost to a halt while people enjoy it. Cassava and other native fruits and seafood are also big components of the native diet.